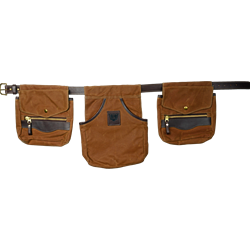 Designed with balance and durability in mind, our Game Belt was made to endure any hunt. Includes two side bags to carry what you need to hit your target, and another to carry your quarry back home. No need to waste time - or space - on your next hunt. Made of solid waxed canvas and 100% full-grain leather with 100 oz. nylon rip-stop lining. *Does not come with a belt.